Behnam Myers, DO (Hollywood) - Book Appointment Online! We specialize in minimally invasive spine surgery and the treatment of degenerative spine, spinal deformity, trauma, tumor, as well as cervical disc replacement and lumbar disc replacement. 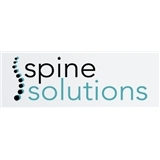 Spine Solutions offices are dedicated to patient care and to helping you feel better today. We currently have two locations in the Miami-Dade area to serve you. We offer free parking and our offices speak the following languages: Farsi, English, Spanish.